The Canon 7D Mark II is Canon's new high-end DSLR in Canon's APS-sensor lineup. Features include a 20.2MP CMOS sensor, 10fps burst rate, an intervalometer, a new battery, and a top ISO of 16,000 that's boostable to 51,200. 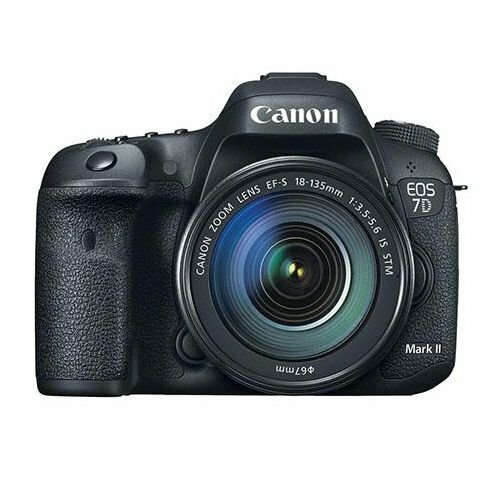 The Canon EOS 7D Mark II is built on a new 20.2MP sensor that Canon says will deliver stunning detail and impressive clarity. The sensor has a top native ISO of 16,000, and it can be expanded to ISO 51,200 with claimed low noise for both stills and video. The sensor works in tandem with Dual Digic 6 image processors, which help the camera up to 1090 JPEGs, 31 RAW and 19 RAW+JPEG shots in a single burst. The image processing also handles lens aberration, peripheral illumination and distortion correction in real time. The shutter is ruggedized and designed for 200,000 cycles. Burst rate is up to 10fps, a major increase, while shutter lag is down to 55 milliseconds. An efficient shutter drive motor and vibration dampened mirror is also part of the package. The camera chassis is built of lightweight, rigid magnesium and is sealed against water and dust. An EOS first: The camera features 65 autofocus points, all cross-type, and boasts accurate subject tracking down to -3 EV sensitivity at the center point. Cross-type AF points are more accurate and stable, and aren't influenced by subject shape and color. The EOS 7D Mark II's AF points are spread across a wide area of the frame for faster AF on off-center subjects. Autofocus is also said to be excellent for video. A new Dual Pixel CMOS AF represents, according to Canon, a milestone in AF speed and accuracy. 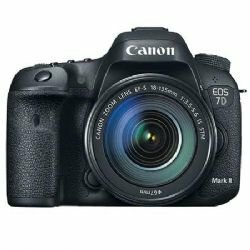 Traditionally, image sensors have one photodiode per pixel for recording, but the CMOS sensor on the 7D Mark II has two photodiodes per pixel-40 million altogether. Each pixel on the sensor can perform phase-difference detection autofocus and capture light. With phase-difference detection AF, autofocus is achieved quickly and easily, and videographers and users of Live View will see the fast-focus results most clearly. Combined with the predictive power of Movie Servo AF, subjects in motion are smoothly and consistently tracked. The Intelligent Viewfinder II makes it easy to both shoot, change and confirm camera settings and shooting modes all without lookingaway from the viewfinder. Displaying approximately 100% of the composition, the viewfinder can show settings like shooting mode, exposure level, white balance, drive mode, AF operation, metering mode, recording format, even an electronic level and more. All of this information can be displayed by or superimposed easily over the image for review while shooting, and multiple views are customizable. The camera's iSA Intelligent Subject Analysis system employs an independent RGB light sensor with approximately 150,000-pixel resolution. This sensorenables intelligent Tracking and Recognition system (iTR AF) that detects and tracks subjects, automatically switching the AF point to optimize tracking. New tracking algorithms are tailored to recognize faces and colors. A new Scene Detection system features a new 150k pixel RGB metering sensor for greater precision. 20.2 Megapixel CMOS (APS-C) sensor and ISO 100 16000: (expandable to H1: 25600, H2: 51200) for reduced noise at high ISOs and high performance Dual DIGIC 6 Image Processors for outstanding image quality and processing speed. High speed continuous shooting: up to 10.0 fps allows you to capture fast action. 65-point all cross-type AF system: for high-performance, accurate subject tracking with EV -3 sensitivity (center point) for focusing in extreme low-light conditions. Stunning Full HD video: with Custom Movie Servo AF (speed and sensitivity) for continuous focus tracking of moving subjects, multiple frame rates including Full HD recording at 60p in MOV and MP4 formats and uncompressed HDMI out. Intelligent Viewfinder II: provides approximately 100% field of view for shootingease. Improved custom controls: and built-in intervalometer and bulb timer for expandedcreativity. Magnesium alloy body: with shutter durability up to 200,000 cycles and enhanced dust and weather resistance. EOS Scene Detection System: features a new 150,000-pixel/RGB+IR metering sensor for improved precision. Built-in GPS Receiver: provides a digital compass, records location information(longitude, latitude, elevation and universal coordinated time (UTC)) as EXIF information for geotagging images when shooting. 3.0-inch Clear View II LCD monitor: (approximately 1,040,000 dots) for bright andclear viewing.